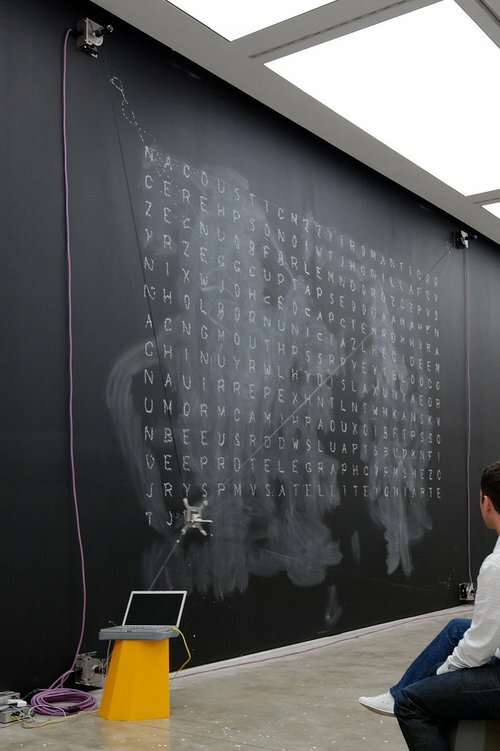 It’s not an obvious design or art exhibition – more like an interactive playroom from the design museum of our dreams. 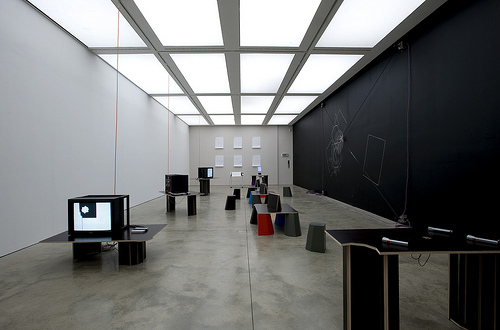 There are just four works on display at the ICA’s A Recent History of Writing & Drawing, a collaborative project by Jürg Lehni and Alex Rich, which comes to an end on 31 August 2008. The star of the show is Lehni’s Viktor - a chalk-drawing behemoth that straddles a big part of one wall. Viktor is a successor to Hektor, Lehni’s famous spraypainting robot. 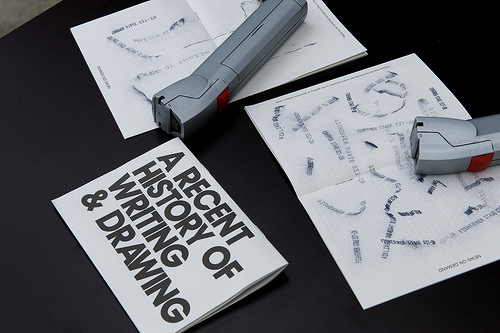 Both are physical systems for writing and drawing, with motors, coils, cables and a drawing head controlled by bespoke code – see ‘Tools to make or break’ (Eye no. 60 vol. 15), David Womack’s article about Lehni’s groundbreaking Scriptographer, a scripting plugin for Adobe Illustrator. 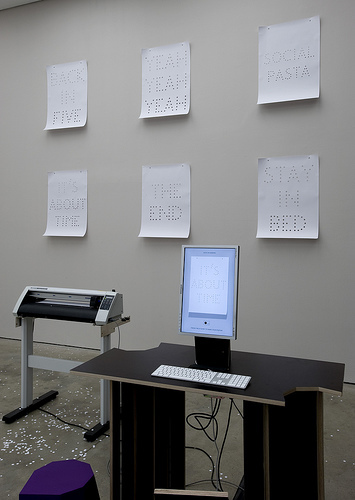 The other two writing systems on display at the ICA show (curated by design historian Emily King) are by both Rich and Lehni: Dots On Demand is a program that turns short phrases into a poster made with an X/Y cutter. A phrase such as ‘TOO MANY COOKS’ or ‘MORE THAN THIS’ is scaled and turned into a dot typeface similar to the lettering for the cover of the Duchamp / Hamilton Green Book (see Eye no. 38 vol. 10), though Rich employs a different matrix. News On Demand uses a hand-held head from a dot-matrix printer to make short headlines: hold down the button on the printer ‘gun’ and it sprays a series of characters at a piece of paper. A graceful, writing-like left to right movement produces a legible print-out; a circular movement makes appropriately shaped text and so on. 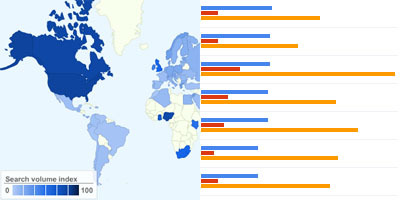 The content: headlines from internet news sources. 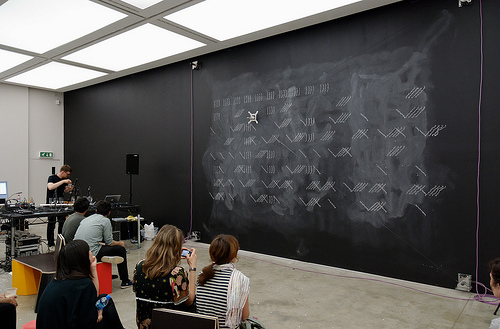 The remaining work, Lehni’s Flood Fill, is a kind of ambient TV art, based on a Commodore 64 algorithm that Lehni discovered as a child. It’s a delicate, virtual counterpart to the ultra-physical technology of the rest of the show. Yet it would be unfair to underestimate the depth of thinking and programming behind ‘A Recent History of Writing & Drawing’. Lehni’s struggles with his devices, the very difficulties involved in bridging the gap between the virtual and the actual, are part of the show’s low-key drama. This is brought into focus by a series of Thursday night events in which guest speakers ‘interact’ with Viktor - chalk and talk, I guess. The last one takes place this week (Thursday 28 Aug) with photographer Jason Evans, the man behind The Daily Nice. The series began with Paul Elliman, who played a handful of recordings (including sounds from the NY Transit, and a Madrid subway announcement) before playing an essay recited by Emma Clarke, best known as the voice of London Transport, while Viktor obediently chalked out a wordsearch puzzle. Elliman also played Clarke reading Whitman, and the instructions for wiring a plug. You had to be there. Other participants have included Ryan Gander and Leila McAlister, James Alwyn and Caitlin Elster (below) . . .
and architect-composer Tuomas Toivonen (below) with his Hyalonium, an electronic glass harp. Another of Owens' projects, Sabre & Mace - Second Death, was concerned more specifically with the online environment Second Life. Collaborating with Tony Mullin, he created SABRE & MACE, a company that offers virtual characters the opportunity to experience death as a way to close their user account permanently. The project examines the notion of feeling sentimental toward a virtual character and examines the link between sentimentality and tangibility. While researching the project, the designers discovered that a great deal of second life residents have multiple avatars, some stay in favour for a long time while others loose their interest. One guy who they spoke to had 14. He said that he used a many of them as platforms for different sides of his real life personality, and for others he invented entirely new fantasy personalities. However he admitted that some of his created avatars had fallen by the wayside and he no longer used them. 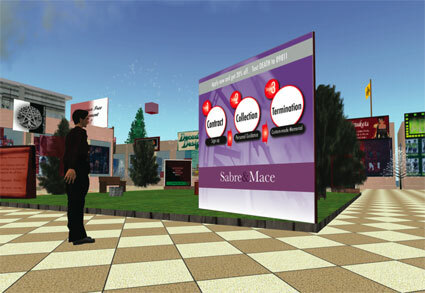 The service works as follows: Having discovered the Sabre&Mace site on-line (unfortunately the website had to be taken down after the show) or through one of the virtual adverts in Second Life, the prospective customer teleports to the company headquarters. There, the client meets a manager who explains the full process and guides him or her through the signing of two contacts. Contract 1 - states that at some point (completely random) in their second life the avatar will be collected by a Sabre & Mace officer and taken back to the headquarters for termination. 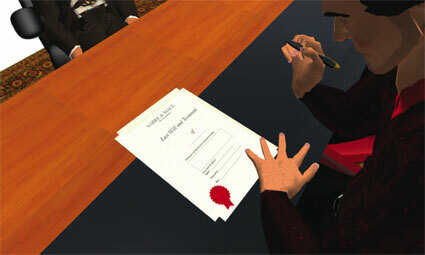 Contract 2 is in fact the client's 'Last will and Testament' where he or she outlines how they wish their virtual moneys, land and assests to be distributed once they have been terminated. The client continues to live their second life until one day, a Sabre & Mace officer appears and informs them that the final proceedings are about to begin. The client is collected and taken to the Sabre & Mace HQ. The client meets again with the client manager, to discuss the final process. At this point the client reveals their 'account password', which is the means by which the avatar is terminated. The client is led through the cryogenic chamber, where the virtual physical forms of past clients are stored. 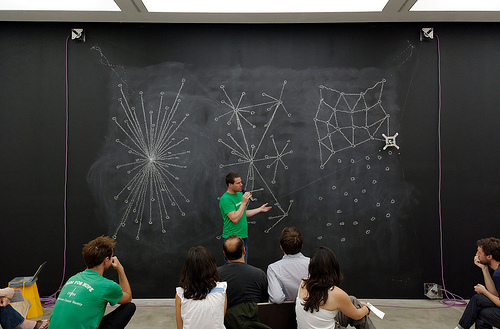 Upon arrival at the 'Termination Room', the client is instructed to walk through the 'white noise' door. Once he crosses the threshold of the door his Second Life game crashes, giving a Sabre & Mace member of staff time to change the clients password - effectively terminating the character. 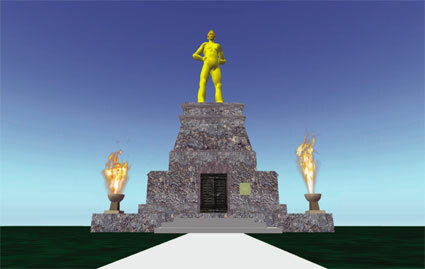 The client's former avatar is immortalised as a golden statue. Information about the avatar can be read on the plaque which sits on the monument. Should the client visit the Sabre & Mace memorial gardens he would see his own statue as well as the monuments of previous clients. Related stories: Mourning and digital culture. They may not yet know it, but gamers will soon be quitting their living rooms and heading outdoors. Handheld consoles and laptops made gaming portable, while the Nintendo Wii made gaming active. Now active, portable gaming is possible thanks to GPS and improved graphics becoming standard in cellphones. [...] Games studios are racing to exploit a new world of what is called “pervasive gaming”, where everyone carries a powerful gaming machine in their pocket. Projet (2002): Can you see me now? A recent development on Facebook has shown that social networking may be more powerful than simply a vehicle for gossip between friends, co-workers and ex-significant others. When Coca-Cola executives responded to a Facebook-based call for humanitarian action, it showed a new opportunity for dialogue between consumers and corporations: smart organizers can harness this kind of rapid message-spreading medium to foster a conversation between the decision-makers at the top and the masses at the point-of-use. 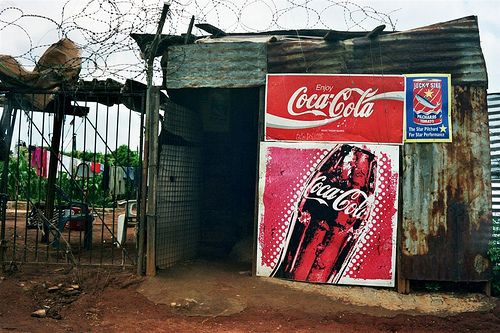 Incensed by the irony that remote African communities had limitless access to bottles of Coca-Cola, but no infrastructure to get medicines to sick children, innovator Simon Berry decided to speak up and ask Coca-Cola to dedicate a fraction of its distribution network to carry medicines for simple, widespread and life-threatening ailments like diarrhea. At first, Berry's ideas fell on deaf ears; after all he was the only recruit in a one-man army. Now, a modest Facebook publicity campaign has catapulted Berry's message into the Coca-Cola boardroom. Salvatore Gabola, global head of stakeholder relations for the beverage giant, took notice of the social networking momentum and has invited Berry to Coca-Cola's European headquarters to discuss his idea (read their recent correspondence here). The size of the campaign's Facebook following – 3,811 at our last visit – is still tiny relative to Coca-Cola's consumer base. But the viral, self-publicizing nature of Berry's campaign is nothing to sneeze at when you're an executive of a company like Coca-Cola, facing significant skepticism from the kinds of creative-minded, marketer-wary users who populate Facebook and other sites like it. 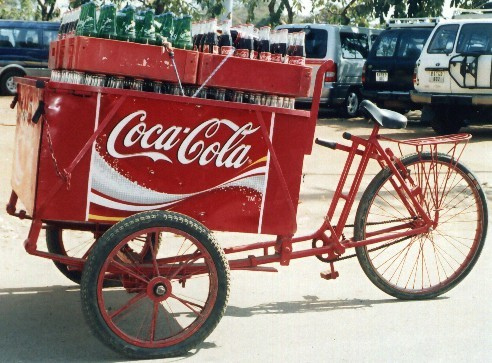 If Coca-Cola can indeed facilitate a medical supply network, the company stands to gain enormous approval from some tougher consumers. I, for one, hope Coke decides (for any reason) to act on Berry's suggestion. Allying the social conscience of global multinationals with a worthy cause may prove to be an important first step towards a better world. If you are interested in reading more about this campaign, check out Simon's blog for the latest on his work and his growing band of eager volunteers. Also, if you have some ideas that might be useful to the project, or would like to get involved directly, feel free to do so here. Hesseltje S. van Goor is a soon-to-be-Media-Management-graduate with a day-time job as marketing executive for Systemlink Ireland. She spends her spare time working on her dissertation and researching green technology..
a new online service by google that allows users to compare search volume patterns across specific regions, categories & time frames.